"Who was Donald B. Palmer?" Exhibit Opening at Springfield, NJ Library - May 14, 2015 ~ The History Girl! In 1983, a collection of eclectic artifacts was bequeathed to the Springfield Free Public Library by a man named Donald B. Palmer. But who was this man, and how did he come to own such an incredible collection of objects? Join us on May 14, 2015 from 5:30 - 7:30pm for the opening reception of the exhibit “Who Was Donald B. Palmer?” curated by Jesse Gordon, Danielle Pace, and Alexandra Simakowicz. The focus of this exhibit will be on the life and accomplishments of Donald B. Palmer, a longtime Springfield resident who was a veteran of World War I, a local philanthropist, and a very active participant in the life of his community. Included in the exhibit will be artifacts dating back to Springfield’s role in the American War of Independence as well as items which date back to the American Civil War. Among the items to be featured at the exhibit will be the Regina Sublima music box that Mr. Palmer bequeathed to the library at the time of his passing. Manufactured in Rahway, the music box came with a set of twenty-one large metal disks that feature music which was popular near the turn of the last century. As part of the reception, Library Director Dale Spindel plans to bring the music box back to life by playing a variety of these disks, featuring such tunes as Wagner’s wedding march from the opera Lohengrin, the Toreador song from Bizet’s Carmen, Sousa’s Stars and Stripes Forever, and a sparkling version of “There’ll Be a Hot Time in the Old Town Tonight.” The music is intended to serve as an accompaniment to the light refreshments that will be served at the reception. Donald B. Palmer was most well-known to his contemporaries in Springfield for riding his high-wheeled bicycle in local parades. He was an active member of the community who served as a decorated volunteer firefighter, received the Lion’s Club award for Outstanding Service to His Community, and had close ties to the Springfield Historical Society. In 1939, he became the volunteer curator at the library where he created thematic exhibitions to display the objects in his collection. Donald B. Palmer’s collection started when he began collecting Native American arrowheads from around Springfield. From there, his interests led him to collect memorabilia from the famous Battle of Springfield, as well as from the Revolutionary War. As his interest in collecting grew, he obtained a variety of objects from different parts of the world but his main focus remained concentrated on items from almost every era in American and world history. The range of items on display in this exhibit will include military artifacts, collectables, and a wide variety of everyday items which are now forgotten but which were once ubiquitous in American homes. Please note that the Palmer Museum closes to the public one half hour before the library’s regular closing time. Funding has been made possible in part by the New Jersey Historical Commission, a division of the Department of State, through a grant administered by the Union County Office of Cultural & Heritage Affairs, Department of Parks & Recreation. 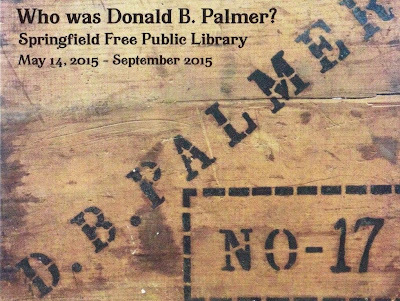 More information about the Donald B. Palmer Museum and the Springfield Free Public Library, visit www.springfieldpubliclibrary.com.